To ensure you feel safe with our products, we have compiled detailed information for you in various brochures. We would be pleased to send you our brochures and other information material free of charge and without obligation. Or you can download the brochures in PDF format simply by clicking on the link. This brochure contains the most important information for patients and relatives regarding intermittent self-catheterisation (ISC) and easy application of the »SIMPLYCATH®« catheter. You will find lots of information, including videos demonstrating catheterisation in clear 3D animation, as well as important tips at www.simplycath.de. In this brochure, you will learn about the symptoms of interstitial cystitis (IC) and how it can be treated with electromotive drug administration (»EMDA®«*). The »EMDA®«* method is a gentle and highly targeted delivery of medication into the bladder tissue using an electrode catheter inserted through the urethra. In this brochure, we have compiled helpful information for patients and caregivers regarding the safe diversion of urine. When travelling, it is essential for patients to carry their medical aids such as catheters, urine collection bags and cleaning and disinfecting agents with them. However, during airport security checks in particular, the items are always queried, which leads to the inconvenience of unpacking them to explain what they are. In order to provide you with an easy and discreet passport to security checks for your upcoming journey, we will gladly provide you with a free medical device passport. Order your medical device passport now. 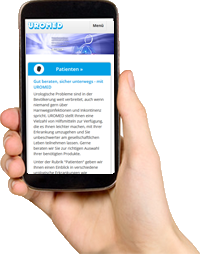 Please send us an email with your contact details (name and address), including your telephone number for queries to simplycath@uromed.de. We will send you your medical device passport shortly.